Domus Live-In Care – 24 hour care and support in the comfort and familiar surroundings of your own home. At Domus Live-In Care we offer a professional, reliable service, providing 24 hour care and support to our clients in the comfort and familiar surroundings of their own homes. Live-in care and support offers a realistic, affordable alternative to residential care, with a price structure based on the level of care and support needed – often costing less than residential care. We understand that the decision to accept any form of care can be difficult and we are committed to providing a personal, tailored care plan to suit your lifestyle and needs, while supporting you to live in the comfort and safety of your own home. Live-In care is an affordable alternative to residential care. It means having a carefully selected carer to stay with you 24 hours a day, 7 days a week to provide any care and assistance required. Our carers provide care for those with Dementia, Parkinson’s, Palliative (end of life) care as well as those recovering from a stroke. 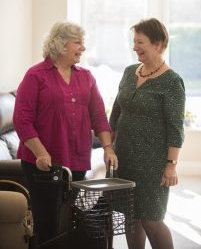 We are committed to finding the right live-in carers for you, and we select and recruit our live-in carers personally. We are always looking for people who are as passionate about and committed to providing excellent live-in care as we are to join our team. Drop us a line by using the form below or call us to discuss your care needs.